France’s Clement Noel competes on his way to win an alpine ski, men’s World Cup slalom in Wengen, Switzerland, on Sunday. Austria’s Marcel Hirscher competes during an alpine ski, men’s World Cup slalom in Wengen, Switzerland, on Sunday. Austria’s Manuel Feller reacts after completing an alpine ski, men’s World Cup slalom in Wengen, Switzerland, on Sunday. 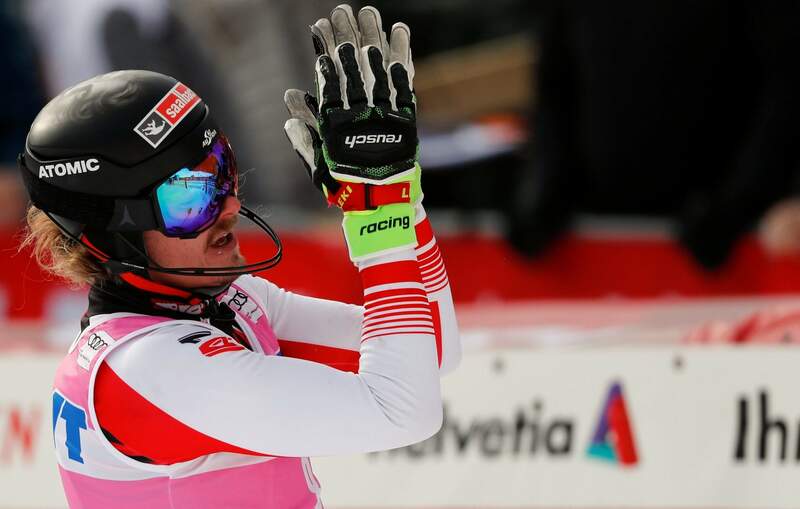 WENGEN, Switzerland – Showing the maturity of a widely touted future star, Clement Noel held off a fierce Austrian challenge in a World Cup slalom Sunday for his first career win. The world’s best men’s slalom skier, Marcel Hirscher, had the fastest second run yet still trailed Noel by 0.10 in third place. 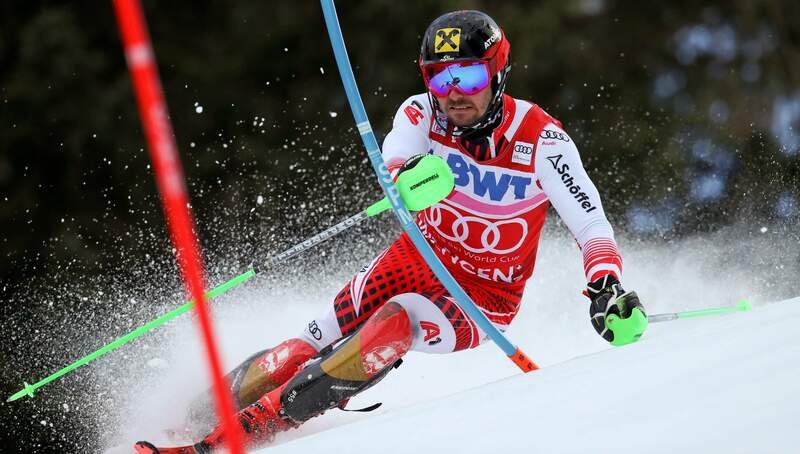 Hirscher, who had won four of the five previous traditional slaloms this season, extended his lead in both the World Cup slalom standings and the overall points race. He is favored to win a record-extending eighth straight overall title. Noel broke through last season on the World Cup circuit, and also won the junior world title. He then placed fourth in the Pyeongchang Olympic slalom just 0.04 outside a medal place. One week ago, Noel got his first World Cup podium place as runner-up at nearby Adelboden where another Hirscher second-run charge was enough for victory. Noel acknowledged feeling the tension at the start, within hearing of a noisy finish-area crowd as Hirscher then Feller took the lead. “It was not so easy but I managed the pressure and that’s cool,” said Noel, who mastered a gate-setting prepared by a French team coach. Sunday’s result ended Hirscher’s streak of standing only on the podium top step this season. After nine wins, Hirscher’s 10th podium finish was the first time he finished second or third. 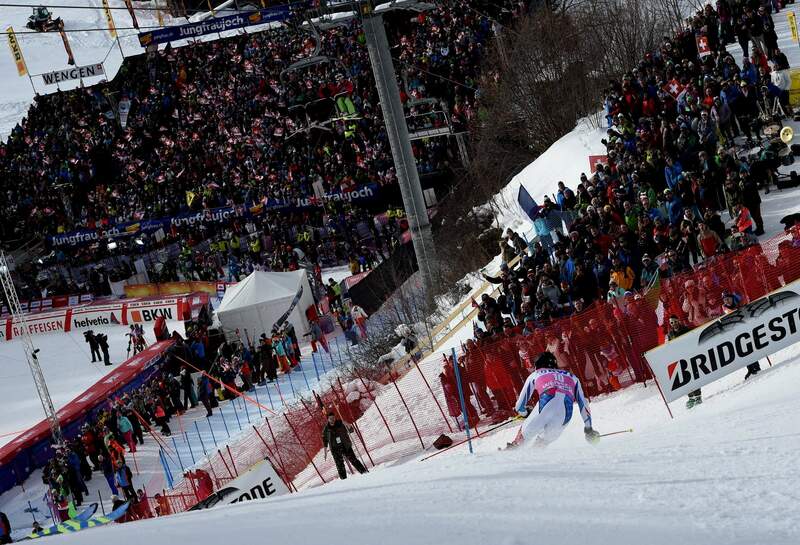 Noel denied Austria a sweep of all three races at Wengen which is Alpine neighbor Switzerland’s signature ski meeting. Vincent Kriechmayr won the classic Lauberhorn downhill Saturday and Marco Schwarz won the Alpine combined event. The one-man United States team Sunday was 18-year-old Ben Ritchie, making his World Cup debut as the only racer in a 74-man lineup born in the 2000s. Ritchie, from Waitsfield, Vermont, placed 40th in the first leg and did not qualify for the afternoon run. The Wengen slalom was contested in the first month of World Cup racing, in January 1967, when French great Jean-Claude Killy won. The quirky slalom slope adjoins the Lauberhorn hill, and the gate-settings weave either side of farm sheds dotted along the course. After two weekends in Switzerland, the World Cup moves to Austria for a three-race meeting at Kitzbuehel including the iconic downhill on Saturday.